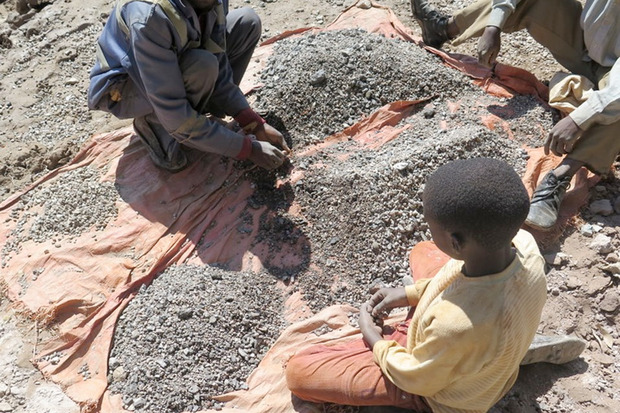 Amnesty International has identified key electronics brands such as Apple and Samsung as not doing the necessary checks to prevent cobalt mined by children from getting into lithium-ion batteries used in their products. The report, by Amnesty International and African Resources Watch (Afrewatch), an African nongovernmental organization, has found that traders buy cobalt from areas where child labor is rife and sell it to a Chinese mineral company. The cobalt reaches the technology companies through a complicated route, involving a number of intermediaries. Congo Dongfang Mining and its parent, Chinese mineral giant Zhejiang Huayou Cobalt, process the cobalt sold to three battery component manufacturers in South Korea and China, which in turn sell to battery makers that claim to supply tech and car companies, including Apple, Microsoft, Samsung, Sony, Daimler and Volkswagen. Over half of the global supply of cobalt comes from the Democratic Republic of the Congo (DRC), and the government estimates that 20% of the cobalt currently exported comes from artisanal miners in the south of the country, including children as young as 7 years, working with their hands and using basic tools, according to the report. Chronic exposure to dust containing cobalt can result in a potentially fatal lung disease, called “hard metal lung disease,” said the report, which also lists other diseases that can come from breathing and skin contact with cobalt. The report blamed the DRC as well as the various parts of the supply chain including companies, stating that the companies' promise of zero-tolerance of child labor was meaningless if they do not investigate their suppliers. Apple, when contacted, emailed a copy of its full submission to Amnesty International. In that statement, it said that underage labor is never tolerated in its supply chain and the company not only has "strict standards, rigorous audits and industry-leading preventative measures, but we also actively look for any violations." The company said it is currently evaluating dozens of different materials, including cobalt, in order to identify labor and environmental risks as well as opportunities for Apple to bring about "effective, scalable and sustainable change," but warned that it could not do this alone and that there are no quick fixes to challenges in the global supply chain. Samsung did not immediately respond. Samsung SDI, the battery-making business of the Samsung group, told Amnesty International and Afrewatch that "it is very hard to trace the source of the mineral due to the suppliers’ nondisclosure of information and the complexity of the supply chains." The company said it was impossible for it to determine whether the cobalt supplied to Samsung SDI comes from DRC Katanga’s mines. Of the 16 multinational companies that were identified in the report as buying from battery manufacturers that used processed cobalt from Huayou Cobalt, two multinational companies denied sourcing any cobalt from the DRC and five denied sourcing through Huayou Cobalt. Some of the companies either accepted or were uncertain about Amnesty’s claims or said they were investigating, according to the report. The U.S. Securities and Exchange Commission adopted a rule in 2012 that requires companies to publicly disclose their use of "conflict minerals" that include tantalum, tin, gold, or tungsten originated in the DRC or an adjoining country. The minerals are described as conflict materials because their sale benefit armed groups in these countries. The cobalt market is not regulated and it does not fall under existing conflict minerals rules in the U.S., according to the Amnesty International report.